Not many Filipinos are aware of the fact that writing on or defacing Philippine peso bills and coins is illegal. And because it's illegal, there's either a fine or jail time awaiting those unfortunate enough to do the act. So the next time you think about drawing a pair of horns on Manuel L. Quezon's forehead or a mustache above Sergio Osmena's lips, you better think again. The prohibition and penalization of Philippine currency defacement and mutilation was put into law on July 18, 1973 when then Philippine president Ferdinand Marcos signed Presidential Decree No. 247. 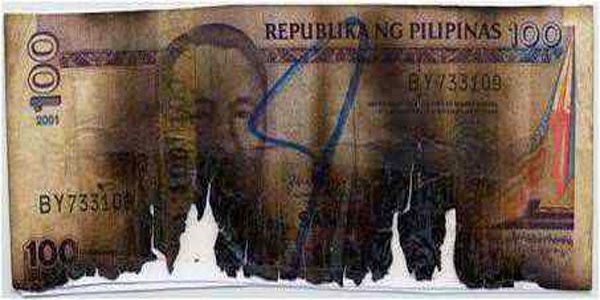 The decree imposes a penalty on anyone caught defacing, mutilating, tearing, destroying, or burning Philippine notes and coins. The decree states that "it shall be unlawful for any person to willfully deface, mutilate, tear, burn, or destroy, in any manner whatsoever, the currency notes and coins issued by the Central Bank of the Philippines". Allow us to tell you more why you should never deface nor write on Philippine peso bills. 1) You might find yourself poorer by a whooping 20,000 pesos. If you are caught and then convicted for violating the decree, you might be fined with an amount that can run up to 20,000 pesos. That's a very steep price to pay for merely writing on money. Imagine the value of this amount when the decree was signed by Marcos in 1973. So if you can't fight the urge to put your name or phone number on paper bills, it's highly recommended that you find "play money" and subject them to your defacement urges instead. You lose nothing and you save yourself from the risk of having to give away 20,000 pesos. 2) You might find yourself languishing in a cold prison cell for up to five years. Violators of the decree can be imprisoned for not more than five years. We don't have to remind you how nasty it can be to spend time in prison. We're talking about Philippine prisons here. We are a third world country so we also have third world prison cells. It's free board and lodging alright but wait till you see the roaches on your bed and the bad food you have to dutifully force down your throats every day. And to state the obvious, spending time in jail for putting marks on a piece of paper is rather embarrassing. You are going to sleep with roaches (or rats) every night and eat bad food every day. For what? Doodling on Corazon Aquino's face. So don't do it. 3) You might get both poisons. That is you pay the fine and spend some time in jail. Yes, it's possible that you can get both ends of the stick. Allow us to quote a section from the decree, "That any person who shall violate this Decree shall, upon conviction, be punished by a fine of not more than twenty thousand pesos and/or by imprisonment of not more than five years." Take note of the double conjunction "and/or". That means you can possibly pay the 20,000 pesos fine and spend five years in prison. It's rather harsh you might say. But it's the law.